Our family bach commands stunning views of the Frankton Arm of Lake Wakatipu and Queenstowns 'Remarkables'. It's a true bach, rich in history and full of memorabilia. Most of the furnishings are from a previous generation although the beds and appliances are near new for a relaxed stay. The bach is in 'Old Frankton', a five minute drive (or a five minute walk from public transport) to the heart of Queenstown. Close to all Queenstowns attractions but away from the crowds. It's a 10 minute walk from the airport so you can fly in and not need a rental car. YES the planes do fly over head and watching them is really cool, especially for kids. It's only a 15 minute walk to a supermarket and major shopping center. The bach and section are child friendly (not fully child-proof) with childproof locks on cupboards containing cleaners, a fireguard, a high chair, cot, kids DVDs and a toy box. There are lots of books, with a focus on the stories and history of Central Otago. A large park, indoor swimming pool with hydroslides, lakeside walking trails, golf course, the Queenstown event center and the lake itself (full of trout and salmon) are all within 10 minutes walk. Queenstown is the perfect place for either a restful break or full-on adventure holiday. Leisurely walks, vineyard lunches, jet boating, bungy jumping, gold panning, horse trecking, four major ski fields and two internationally acclaimed golf course all nearby and last but not least its Lord of the Rings country with tours to suit everyone. We can supply you with a list of family friendly things you can do for free and our favouite cafes. The bach is warm with 2 nightstore heaters, radiant heaters in each room and an open fire. The Castle is the perfect base for your lakes holiday. Close to Arrowtown and an easy drive to Clyde, Roxborough, Wanaka and Hawea. It's even used as a base for the Otago rail trail. Suitable for 4 adults only. Guests must leave bach TIDY. You do NOT need to clean or launder linen but we DO expect you to do your own dishes! No access to locked cupboards or to seperate garage. Stunning view from the main lounge. We appreciate that it was a house full of personal history and trusting family memories. As experienced Airbnb and B&B persons ourselves who provide milk, butter in the fridge for our guests etc., that these were not provided. we were also surprised that we needed to find the trundle and mattress and make a bed up for our niece for the night - information was provided after a phone call. Perhaps for guests that don't have a car, a more explicit map as to the walking distance to the local restaurants would have helped as we were tired when we arrived and needed a meal. The location was excellent of course and we were able to walk to the airport to catch our return flights. And the planes of course taking off at the end of the airport over the house was unexpected. This review may seem critical but as an Airbnb host myself, I hope we have helped to perhaps update information for future guests as the view is stunning. 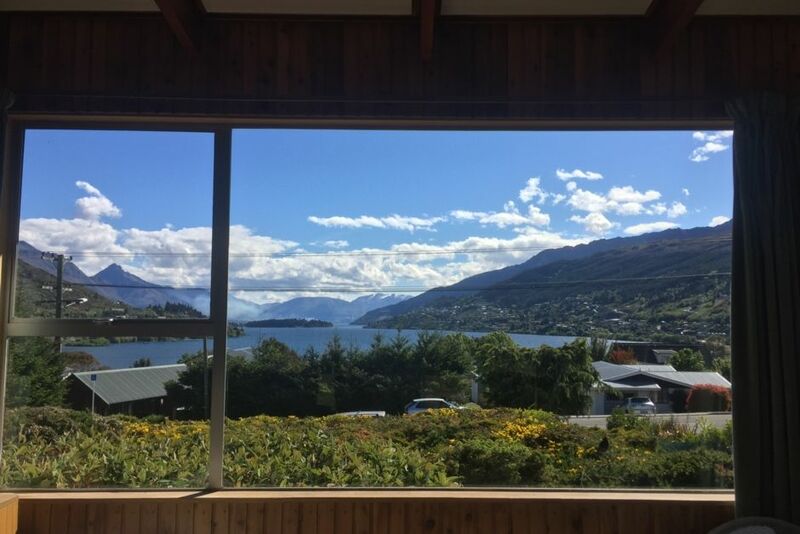 Terrific views of Queenstown, comfortable and well located. We thought the property was very comfortable with everything you could need. The views are fantastic. We absolutely enjoyed our stay. Great location.